Just like boats, children (especially boys) are fascinated with trucks. Some will never grow out of that stage. Because of this trucks will forever be a popular theme in children books. Fire trucks and dump trucks are the most popular types when it comes to crafts. Both these trucks can be made from boxes or Styrofoam egg cartons. 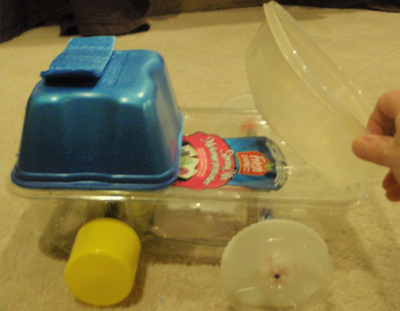 Trucks can also be made from empty milk cartons and using water bottle or soda bottle caps for the wheels and straws or bamboo skewers for the wheel axles. You can also make a truck collage with your toddlers using different color construction paper or card stock. First get 4 empty thread spools. Glue 2 thread spools together. Do this again to make 2 sets of 2. Cut out 4 cardboard wheels. In the center of each wheel, poke a large hole in each of them, large enough for a pencil to spin inside of it. 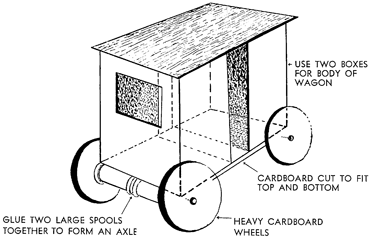 Take a straw, a skewer, dowel, pencil, large twigs, etc and put it through the cardboard wheel, the spool and the 2nd's wheel so that it starts looking like wheels on an axel. Then get some clay or play dough and put it on the outside of both wheels so that they can't fly off. Now do this again for the 2nd set of wheels. Glue s 2 small boxes to a larger piece of cardboard on the bottom....so that there is a smape in the center to see all the way through. This is where the ice cream man will give you the ice cream. Glue another piece of larger cardboard on the top as well...for the roof. Now glue the axels to the bottom of the boxes. When it has dried...you can paint the ice cream truck. Then you can test drive it. Make adjustments if it doesn't roll. I made a rubberband powered dump truck from household items and I thought I would share with you how I did this. First get a container or a box that you can use as the base of the truck. For the axels, I used markers, glued together so that they wouldn't come apart. I made sure that the markers stayed together by using heavy tape around each seam. For the wheels I used Butter spray caps and spools from an old vcr tape. I poked holes int he base of the truck (the container). I put the axels through the holes and then I glued on the wheels. Now cut a hole in the front of the truck (on the container). Use tape all around the inside of this hole so it doesn't get bigger. Now loop 3 rubberbands together and tie it around the back wheel's axels by looping it around itself....electrical tape it to these markers as well. Then tie it to the front hole that you made. Now to make it work, just roll the back wheels towards you as you move backwards. Let go when it starts pulling really hard on the front of the car. Zoom.....put the finishing details on the truck. Click here to see the full instructions. Big Rigs : How to Make Toy Trucks from Recycled Boxes - - Gather up some recycled boxes and bottle caps. That’s almost all you need to make a tractor trailer than can zoom down the highway of your imagination! Drinking Straws Trucks to Make for Preschoolers & Toddlers - - This was a collaborative effort, my son was watching a show about the Three Little Pigs and the one pig with a straw house sparked his interest in making something with drinking straws. So his first request was a train, but we didn’t have enough straws so we settled on a pick up truck. This does require some prep but I love how it turned out. The placing of the straws is tricky but it’s a great lesson in fine motor and patience! Dump-Truck Crafts for Children- - A dump truck's size alone leaves kids in awe. The fact that these construction machines can also move rock, dirt and lots of other heavy objects adds to the infatuation most children have with dump trucks. Dump-truck crafts let the kids create their own hauling machines in a more creative format. Easy Fire Truck Crafts to Make- - This simple fire truck craft requires a printer, a piece of paper, some crayons (or paint or markers), scissors and glue. I always prefer to use a heavy paper (like construction paper), but it isn't necessary. Field Trip to the Fire Stations Craft for Kindergarteners & Preschoolers - - Collect, organize, and graph data after a visit to a fire station. Fire Engine Paper Crafts Ideas - - A simple fire engine truck paper craft for kids. Fire Engine Making Cardboard Boxes Instructions - - What a fantastic use for a cardboard box! All boys should have their own fire engine, and if they help to make it they will enjoy playing with it even more. Fire Engine Posters to Make- - Let your little ones be fire-fighters! This was a big hit with my boys and still graces our walls nearly a year after we made it. While we made a very large version, the same idea can be made smaller for a special card. Fireman on the Go Pretty Pictures - - Firemen play an important role in our community. This art project fosters awareness on community roles and also reinforces shape recognition and learning. Fire Truck - - If someone needs help, this Fire Truck will sure save the day! Fire Truck Costume - - Karla explains how to transform a large, cardboard box into a fire truck costume. Fire Truck Craft - - This fire truck craft does take some prep work but is a great lesson in shapes and as your child gets older you can simply give them the pieces and let them put them together like a puzzle. Fire Truck Craft - - Make this Fire Truck out of a milk carton. Fire Truck Craft for Kids - - Fire prevention crafts for preschool kids are an excellent addition to fire prevention and fire safety lessons and activities. Learn how to make this fire truck craft from a recycled egg carton and simple craft materials. Fire Truck Crafts for Kids - - Making crafts with kids offers a hands-on outlet for their creativity and an opportunity to learn about different topics in a fun and exciting way. Constructing fire trucks from edible items, or different recycled items from around the house, is an entertaining approach to introduce the topic of community helpers, as well as offering hours of amusement or an edible snack. Haulin’ Trucks - - "Breaker! Breaker! We got ourselves a convoy!" Make your very own shoebox fleet of cargo trucks for loads of fun! Kid Made Monster Truck - - You will make a mess, but it was fun. Kidz Dump Truck - Have your kids make this dump truck with recycled materials found in every house. Mini Truck Box Template - - Simple and easy craft template to create a fun gift box or a cool toy. Economical, high-quality design and versatile template which you can easily print out and use for many different craft activities. Monster Truck Collage - - This Monster Truck Collage will please any Monster Truck Fan. This is a great craft for Birthday parties, or just for an every day fun craft for the truck enthusiast! Presto Dots Trucks - - Have a Presto Dots monster truck show with vehicles you create and build yourself with old toys, Crayola® Model Magic® Presto Dots™, and your custom designs. Recycled milk carton truck tutorial - - Make this truck out of a recycled milk carton. Shape Truck - - Have your kids make a truck using a variety of shapes and colors. Soapbox Truck - - Get things rolling on a rainy day with this toy truck project. Stroller Costumes - - Dress up your toddler's stroller so he can trick-or-treat with the big kids. Make any kind of vehicle... a fire truck, a police car, a train. The possibilities are endless! Terrific Trucks - - Great truck craft projects for any truck enthusiast. Toddler Truck Craft - - Fun crafts that are easy enough for your toddler to do with you. Make fun things for your child to play with or fun gift s for someone. Tow Trucks - - If you ever break down, now you'll have the perfect tow truck. Truck - - Make these cute paper trucks with your kids. Truck - - Truck assembly instructions and templates are available in the book "Giocattoli in cartone ondulato" together with the free english translation appendix. Trucks at Work - - How do juicy oranges arrive at a grocery store in winter? Cargo trucks are on the road year-round. Create your own business fleet! Unloading Some Love - - Try Unloading Some Love on Valentines Day by having the kids make this cute dump truck Valentine. Preschoolers will need help cutting the shapes, but they can do all the gluing! This is a great Valentine for boys or anyone you want to dump some love on!